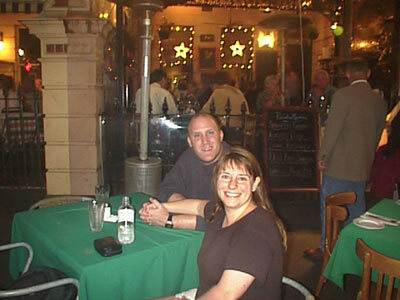 When we visited Melbourne in 1999. we felt like we could live in Melbourne. We had the exact same favorable impression this trip. If only Australia weren't so far from Chicago! 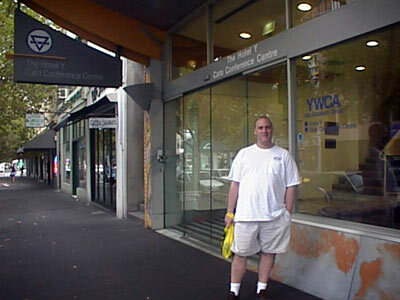 Since work was not paying for the Sheraton Southbank hotel, Tara decided that we'd stay at the YWCA. 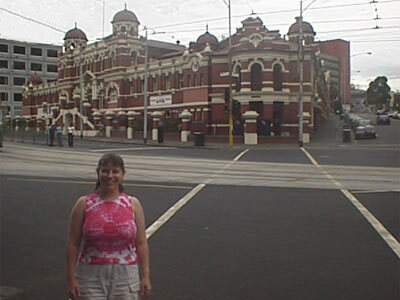 She'd read in many guidebooks that it was one of the best budget accomodations in Melbourne. Seth had a bit of a scary impression of YMCA's from the Village People's YMCA song, but he was brave enough to try the YWCA. It turned out to be a good place to settle into for five nights. Seth had a little desk where he could connect the computer to the internet, Tara had a nice sunny bed to lay on. We had a refridgerator to store all the food we kept buying at the Victoria Market. 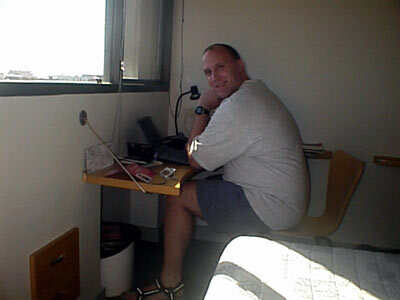 We even had air conditioning since we were in a deluxe room. 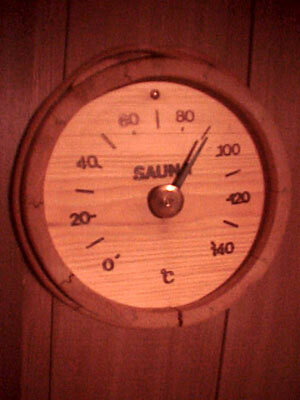 Good thing too that we had aircon since we were in Melbourne at a hot time! Tara did not want to miss summer in Australia and luckily she got a good taste of it in Melbourne in early March. 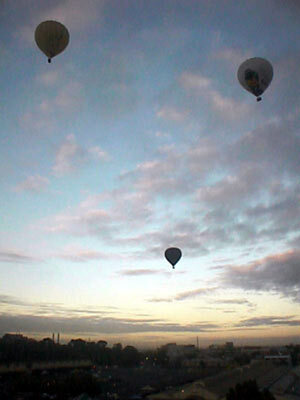 We also had a net view out our window of Victoria Market and even hot air balloons one morning. We very much enjoyed visiting the City Baths daily to go for a swim. One of the reasons Tara had picked the YWCA was because it had free access to the swimming pool. We were a bit put off by the fact that the swimming pool was two block away, but that didn't stop us from trying out the pool. It was great to actually exercise - especially after being in America and eating American food for three months! We missed only one opportunity to swim in the six days that we could go swimming. 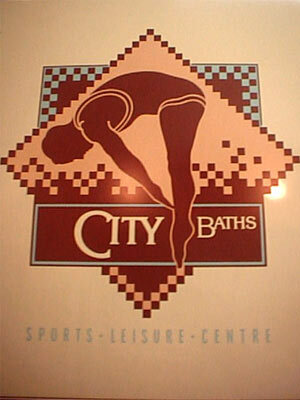 In addition to a large lap pool, the City Baths had whirlpool spas and saunas. Inside the changing rooms there were especially interesting whilpool spas. Tara said that the metal "bed" that was in the water for you to lay on either looked like a Chinese water torture device or a water-hydro treatment bed that you'd pay US$100/hour to use in a top-end spa hotel. We didn't let the look of the bed deter either of us and we enjoyed (for as long as we could stand) water bubbles massaging our bodies. Tara's favorite activity at the City Baths, of course, was to spend as long as humanly possible in the 90 degree Centigrade sauna before dousing herself in cold water and returning to the heat! 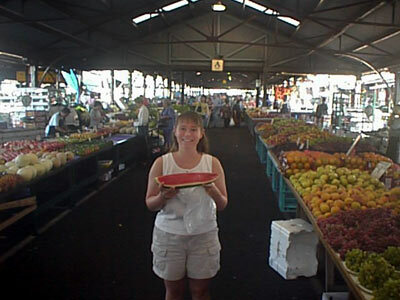 We also visited the Victoria Market almost daily since the YWCA was just around the corner. Our room had a refridgerator, so we were able to buy various fruits, greek dips, bread and milk for breakfast and snacks. It was fun to pop over to the market whenever we wanted. We did make a big mistake though one day. We went to the market just before we planned to go to the postoffice and mail a box home. We had a lot of fun buying souveniers that we would have normally passed up. We normally restrict our buying since we know that we have to carry anything extra that we buy. But not on this day since we knew we'd be sending a box home that day. We were excited to see that the Cirque du Solei was in town and just opening their Allegria show days after we arrived. We easily obtained good seats at a ticket outlet and had an enjoyable evening seeing Allegria again. This show was different from London in that it was staged in a true big top tent. It was also a much smaller venue than the Royal Albert Hall in London, so it had a neat atmosphere. Just like before, we really enjoyed the men running and criss-crossing each other as they flipped and flopped on long trampolenes. It was a very enjoyable night out on the town. Our timing to Melbourne was excellent even though it was totally unplanned. We were in town for the final day of the Grand Prix - and even though we didn't buy a ticket to go inside, we drove past in our Sunday drive around town in our Seva's hosts' Rolls Royce. We were also in town for the Moomba festival activities. These included various performances Friday night, Fireworks along the river Saturday night and a tram parade on Monday. The performances Friday night were OK - but started much later than scheduled and were a bit too artsy for our tastes. 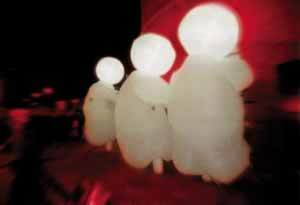 The first show was called Herbert's Dream and consisted of people walking on stilts and "praying" to a large illuminated white sphere that symbolized the moon. These people were "moon-beings" since they had large illuminated white spheres for heads. It was sortof neat and OK to watch. The second show was so bizarre that Seth at one point commented that to enjoy it you either needed to be extremely new-age artsy or on drugs! We left halfway through the 45-minute show that featured people bobbing around on the top of flexible sticks waving their arms slowly back and forth. 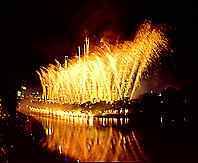 The fireworks along the River Yarra in the center of town were fun. Seth picked a terriffic vantage point in the middle of a bridge and we had a nice view of the river bend where fireworks both on the ground and in the air were visible. There were even some boats shooting off fireworks and large flames. 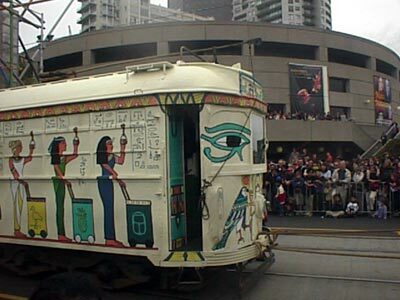 The final Moomba event that we saw was the tram parade in the afternoon on Monday. The tram parade was fun. There were a wide array of trams. 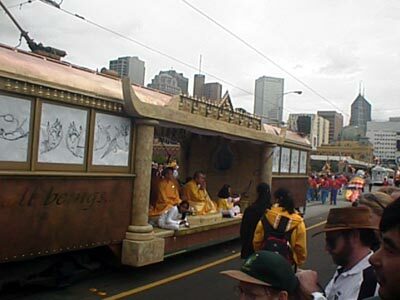 We especially remember the Indian tram, the Buddah tram and the bubble containing a naked man and woman! The parade was the start of a big street party, but we didn't stay for the street party since it looked too crowded to be enjoyable. Since we were staying just North of the city center and all the Moomba events were in the South of the city, we walked through the downtown of Melbourne numerous times. 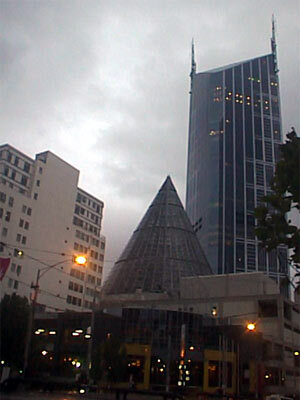 We thought that this pyramidal building was neat. Each walk strengthened our conviction that Melbourne would be a great city to live in. We enjoyed the city so much that we never got to Philip Island for the penguin parade and wouldn't have left the city at all if Tara wouldn't have forgotten her hair brush in Kooyong at our Servas' hosts. Alan and Lorraine invited us to accompany them to the Dandenong Hills for afternoon tea on Sunday. We readily accepted. The start of the hills was approximately an hours drive out of the city center and Alan drove on on a sightseeing tour through a few fun neighborhoods we hadn't seen before including a bohemian/artistic town and the Vietnamese part of town. We also took a long highway straight West after leaving the city. We enoyed getting back to nature and driving by tall ash trees. The place we stopped for lunch was nestled alone in an area where we couldn't hear traffic noise. We passed many cute little touristy towns and stopped once to see a restaurant where people were feeding wild kookaburas by hand out the restaurant windows. We saw numerous kookaburas arriving for the free food! It was an enjoyable day out and Tara got her hairbrush back. It's amazing how well you can comb your hair with only your fingers for five nights! 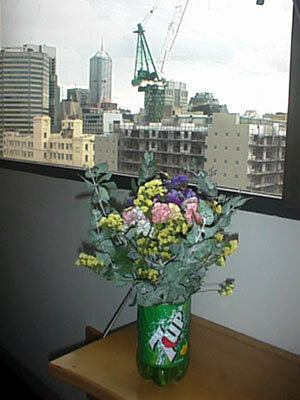 The Southbank - This is where we stayed on our first trip to Melbourne. Since the company was paying, we stayed in the Sheraton. This trip, we simply walked along the Southbank and enjoyed the city views. Numerous live bands - We do not know if the large number of bands were only because of Moomba, but we don't think so. We ducked into a shopping mall on our way home Friday night headed to the food court for dinner. We were surprised to find a live band playing in the food court seating area. And this was only one example of many live musicians we heard. 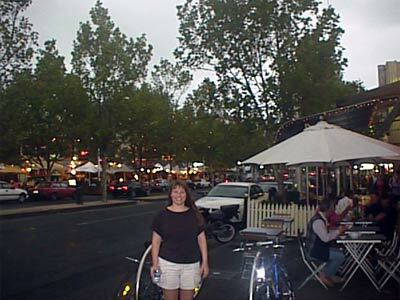 Lygon Street - On our first trip to Melbourne, we ate dinner at one of the many restaurants lining Lygon street. 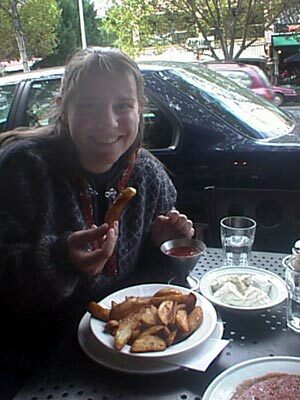 We definitely wanted to head back this trip and we did twice - once for dinner and once for lunch. Chinatown - The gate marking the main entrance to Chinatown is a bit modern for Tara's tastes after being accustomed to the gates in London, but even so, we kept finding ourselves walking through Chinatown. We found Japanese food and went to the same restaurant twice in five days. Eating outside - The majority of our meals were eaten outside at tables set up on the wide sidewalk in front of the restaurant we'd chosen. Typically a restaurant will have a glass screen separating diners from the traffic and it was very pleasant to eat outside. For all these reasons and more, we like Melbourne. We have been told that Melbourne is the most European city in Australia - so maybe that is one of the reasons it appeals to us. We just wish Star Trekkie transporters were here today so that we could move to Melbouren without considering the 24-hour travel time between here and Chicago! Accommodation We liked staying at the YWCA. 4 March: Sydney to Melbourne on Qantas 427 at 11am - economy. Red Hot E-Deal purchased on www.qantas.com.au for AUD 66 per person one way. The Qantas Club lounge at Sydney's domestic terminal is excellent! 13 March: Melbourne to Sydney on Qantas 422 at 10am - economy seats 46A and 46B. Red Hot E-Deal purchased on www.qantas.com.au for AUD 69.74 per person one way. 13 March: Sydney to Nadi on Qantas 391 (Operated by Air Pacific 910) at 1pm - seats 34J and 34K. British Airways award ticket.